Absorption lines for air, under indirect illumination, with the direct light source not visible, so that the gas is not directly between source and detector. Here, Fraunhofer lines in sunlight and Rayleigh scattering of this sunlight is the "source." This is the spectrum of a blue sky somewhat close to the horizon, pointing east at around 3 or 4 pm (i.e., Sun in the West) on a clear day. A spectral line is a dark or bright line in an otherwise uniform and continuous spectrum, resulting from emission or absorption of light in a narrow frequency range, compared with the nearby frequencies. Spectral lines are often used to identify atoms and molecules from their characteristic spectral lines. These "fingerprints" can be compared to the previously collected "fingerprints" of atoms and molecules, and are thus used to identify the atomic and molecular components of stars and planets which would otherwise be impossible. 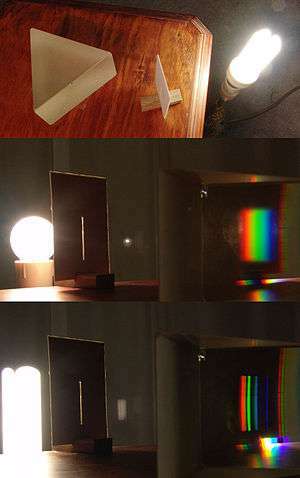 Continuous spectrum of an incandescent lamp (mid) and discrete spectrum lines of a fluorescent lamp (bottom). A spectral line may be observed either as an emission line or an absorption line. Which type of line is observed depends on the type of material and its temperature relative to another emission source. An absorption line is produced when photons from a hot, broad spectrum source pass through a cold material. The intensity of light, over a narrow frequency range, is reduced due to absorption by the material and re-emission in random directions. By contrast, a bright, emission line is produced when photons from a hot material are detected in the presence of a broad spectrum from a cold source. The intensity of light, over a narrow frequency range, is increased due to emission by the material. Spectral lines are highly atom-specific, and can be used to identify the chemical composition of any medium capable of letting light pass through it (typically gas is used). Several elements were discovered by spectroscopic means, such as helium, thallium, and cerium. Spectral lines also depend on the physical conditions of the gas, so they are widely used to determine the chemical composition of stars and other celestial bodies that cannot be analyzed by other means, as well as their physical conditions. Strong spectral lines in the visible part of the spectrum often have a unique Fraunhofer line designation, such as K for a line at 393.366 nm emerging from singly ionized Ca+, though some of the Fraunhofer "lines" are blends of multiple lines from several different species. In other cases the lines are designated according to the level of ionization by adding a Roman numeral to the designation of the chemical element, so that Ca+ also has the designation Ca II. Neutral atoms are denoted with the roman number I, singly ionized atoms with II, and so on, so that for example Fe IX (IX, roman 9) represents eight times ionized iron. More detailed designations usually include the line wavelength and may include a multiplet number (for atomic lines) or band designation (for molecular lines). 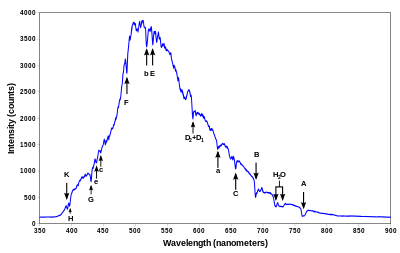 Many spectral lines of atomic hydrogen also have designations within their respective series, such as the Lyman series or Balmer series. Quasistatic pressure broadening: The presence of other particles shifts the energy levels in the emitting particle, thereby altering the frequency of the emitted radiation. The duration of the influence is much longer than the lifetime of the emission process. This effect depends on the density of the gas, but is rather insensitive to temperature. The form of the line profile is determined by the functional form of the perturbing force with respect to distance from the perturbing particle. There may also be a shift in the line center. The general expression for the lineshape resulting from quasistatic pressure broadening is a 4-parameter generalization of the Gaussian distribution known as a stable distribution. Linear Stark broadening occurs via the linear Stark effect, which results from the interaction of an emitter with an electric field, causing a shift in energy that is linear in the field strength. Resonance broadening occurs when the perturbing particle is of the same type as the emitting particle, which introduces the possibility of an energy exchange process. Quadratic Stark broadening occurs via the quadratic Stark effect, which results from the interaction of an emitter with an electric field, causing a shift in energy that is quadratic in the field strength. Van der Waals broadening occurs when the emitting particle is being perturbed by van der Waals forces. For the quasistatic case, a van der Waals profile[note 1] is often useful in describing the profile. The energy shift as a function of distance is given in the wings by e.g. the Lennard-Jones potential. Electromagnetic radiation emitted at a particular point in space can be reabsorbed as it travels through space. This absorption depends on wavelength. The line is broadened because the photons at the line wings have a smaller reabsorption probability than the photons at the line center. Indeed, the reabsorption near the line center may be so great as to cause a self reversal in which the intensity at the center of the line is less than in the wings. This process is also sometimes called self-absorption. ↑ Rothman, L.S. ; Gordon, I.E. ; Babikov, Y.; Barbe, A.; Chris Benner, D.; Bernath, P.F. ; Birk, M.; Bizzocchi, L.; Boudon, V.; Brown, L.R. ; Campargue, A.; Chance, K.; Cohen, E.A. ; Coudert, L.H. ; Devi, V.M. ; Drouin, B.J. ; Fayt, A.; Flaud, J.-M.; Gamache, R.R. ; Harrison, J.J.; Hartmann, J.-M.; Hill, C.; Hodges, J.T. ; Jacquemart, D.; Jolly, A.; Lamouroux, J.; Le Roy, R.J.; Li, G.; Long, D.A. ; et al. (2013). "The HITRAN2012 molecular spectroscopic database". Journal of Quantitative Spectroscopy and Radiative Transfer. 130: 4–50. Bibcode:2013JQSRT.130....4R. doi:10.1016/j.jqsrt.2013.07.002. ISSN 0022-4073. ↑ For example, in the following article, decay was suppressed via a microwave cavity, thus reducing the natural broadening: Gabrielse, Gerald; H. Dehmelt (1985). "Observation of Inhibited Spontaneous Emission". Physical Review Letters. 55 (1): 67–70. Bibcode:1985PhRvL..55...67G. doi:10.1103/PhysRevLett.55.67. PMID 10031682. ↑ "Collisional Broadening". Fas.harvard.edu. Retrieved 2015-05-02. ↑ Peach, G. (1981). "Theory of the pressure broadening and shift of spectral lines". Advances in Physics. 30 (3): 367–474. Bibcode:1981AdPhy..30..367P. doi:10.1080/00018738100101467.